Open a tin of blue wintergreen Altoids. Hand a few out to friends who need one and take one out for yourself. Instantly your blue Altoid turns into a red cinnamon one. Eat it, then blow on the tin itself. ALL the mints in the tin now change to red cinnamon ones! Dragon Breath effects are structured in such a way that you start and end totally clean! 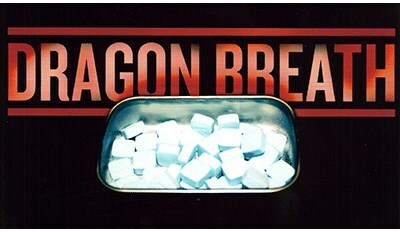 Dragon Breath utilizes one tin and only one tin. Absolutely no switches or need to carry additional items! Dragon Breath is 100% examinable. Spectators are free to pass around the tin afterwards and even eat the mints! Dragon Breath allows you to customize your routine. Make Altoids turn into Red Hots, Orange Tic Tacs, Tiny Chiclets, Nerds... It's totally up to you!